When: Friday, March 2: three sessions from 10 a.m. until 5 p.m.
On the margins of the international community for decades, North Korea has been pursuing and ramping up a nuclear program and has made direct threats toward the United States. The most recent threat came in November when the country claimed to have successfully tested a new type of international ballistic missile that could reach North America, a claim that US-based experts confirm is supported by their data. Heightened rhetoric from Leader Kim Jong-un and US President Donald Trump have made frequent headlines around the world, leaving many people concerned about what appears to be an increasing threat, and unsure what is hype and what is reality. 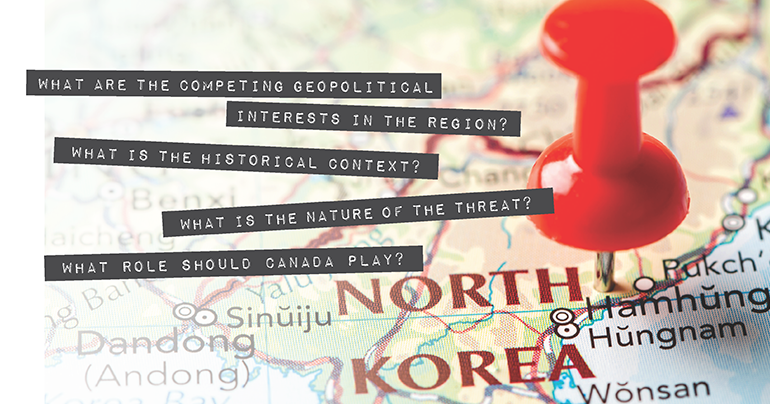 This daylong symposium will bring together six experts to discuss the nature of the threat, the historical context, the competing geopolitical interests in the region and what role Canada should play. Speakers at this event include: Sven Jurschewsky, former Senior Counselor, Canadian Foreign Service in China; David Chatterson, Canada’s Ambassador to Korea (2011-2014); Gunn Kim, Consul General of the Republic of Korea; Scott Snyder, Council on Foreign Relations, Washington, D.C.; Jenny Town, US-Korea Institute, Johns Hopkins University; and Donald Baker, Professor of Korean History, UBC Vancouver. The discussion will also examine how people can better assess what they see in the media on international politics and diplomacy. Historical context: How did we get to where we are today? Analyzing previous negotiations and engagement with the regime and their outcomes. Geopolitical interests and responses: What are the core interests of the main players in the region and the international community and how are they pursuing those interests? What should we learn from this situation? What are the implications for Canada? This free event is sponsored by the Roger W. Gale Symposium in Philosophy, Politics and Economics. It is presented by the Irving K. Barber School of Arts and Sciences’ Department of Economics, Philosophy and Political Science. Guests can attend all sessions or any of the three, which begin at 10 a.m., 12:30 and 3 p.m.
For more information or to register visit: northkorea-symposium-2018.eventbrite.com.